Note: This notification is being delivered to fulfill a requirement as part of a rulemaking passed down from the Pipeline and Hazardous Materials Association that takes effect on April 14, 2017. You may request that the City of Alton install an excess flow valve (EFV) on the gas line to your property. EFVs are mechanical shut-off devices that a utility can install in the gas pipe running from the gas main to the gas meter at your property (the “service line”). 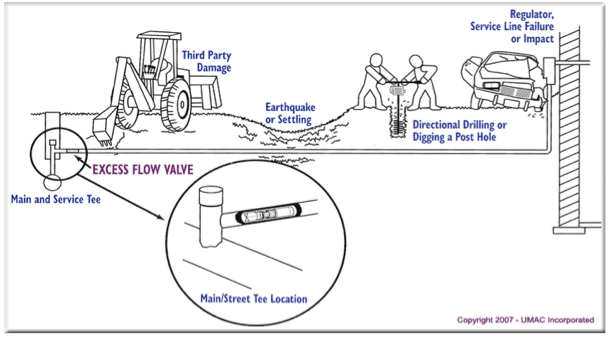 An EFV is designed to stop the gas flow if the service line is broken, for example, by an excavation accident. Stopping the gas flow from a broken service line significantly reduces the risk of natural gas fire, explosion, personal injury and/or property damage. 1. Potential advantages & disadvantages of Excess Flow Valves (EFVs). a. An EFV is designed to shut off the gas flow if the service line is severed between the gas main and the meter set. b. What an EFV won’t do? – An EFV is NOT designed to close if a leak occurs beyond the gas meter on house piping or appliances. An EFV also may not close if the leak on the service line is small. c. Possibility of EFV activation (closure) if the customer adds load. – If you add, for example, more gas appliances, a pool heater, emergency generator, etc., the additional gas flow may cause the EFV to close. i. You will be billed for the cost of installing the EFV. The average installation cost is typically $700-$1200. Not included in the estimated cost are cement or asphalt streets, landscaping and other utilities; the actual installation cost will depend on the difficulty of installation. We will inform you of the actual cost before you make the final decision that you want an EFV. c. What might trigger a need to replace the EFV? i. Customer adds load: EFV replacement may be necessary if you add additional gas appliances, such as a pool heater or emergency generator that exceeds the capacity of the EFV. ii. EFV fails closed/open: EFV replacement may be necessary if the EFV malfunctions (sticks open or closed). iii. Probability of failure based on industry experience: Industry experience is that EFVs rarely malfunction. 3. If a service-line customer requests EFV installation and the load does not exceed 1,000 SCFH and the conditions listed below are not present, the operator must install an EFV at a mutually agreeable date. IMPORTANT NOTE: EFVs cannot be installed on some service lines due to high gas flow, low pressure or other factors. If you request an EFV but your service line cannot accommodate an EFV, the City of Alton will inform you. The Alton Planning and Zoning Board will conduct a hearing at the time and date specified above, to consider amending the General Commercial District Zoning by adding new residential uses to Sec 8.2 Special Exception Uses of Article VIII GC for The City of Alton. The Alton City Council will conduct a hearing at the time and date specified above, to consider amending the General Commercial District Zoning by adding new residential uses to Sec 8.2 Special Exception Uses of Article VIII GC for The City of Alton. The Board of Adjustment will conduct a hearing at the time and date specified above, in order to consider a variance for Babcock Locker, whose property is located at 109 9th St, Alton, Ia.